We’re getting closer, friends. In less than 24 hours we’ll know who will be competing against Harriet Bedell for the Golden Halo. Yes, you heard that correctly, Harriet Bedell! Did anyone who filled out a bracket have Harriet competing in the championship round? Anybody? Harriet capped off a stunning Cinderella-like romp through Lent Madness 2014 by defeating Lydia yesterday 54% to 46% and will vie for the Golden Halo on Spy Wednesday with either Charles Wesley or Phillips Brooks. But first, Charles and Phillips stare one another down in this battle of wordsmiths. Hymn writer and preacher. Though, to be fair, Wesley preached a bunch of sermons and Brooks wrote some hymns. And many generations have been inspired by their passion and creativity. To make it this far, Charles Wesley defeated John Wesley, Thomas Merton, and Anna Cooper while Phillips Brooks turned away Simeon, Catherine of Siena, and Julia Chester Emery. Oh, and congratulations to the Lent Madness Faithful for helping us achieve our goal of 10,000 likes on Facebook! We had great faith in you and the milestone was tripped at 10:18 pm Eastern Standard Time by a Canadian (of all things) proving that Lent Madness is indeed a global phenomenon. Or at least that Maple Anglican is a lot more influential than we thought. In one sense, of course the case for Charles Wesley centers on his 6,000+ hymns. For me, those hymns have been present at some of the most dear and cherished moments of my life –- I’ve attended weddings and funerals and sung Love Divine, All Loves Excelling. I recall the Christmas Eve eucharists as child where I would be so excited to sing Hark! The Herald Angels Sing. Easter morning was never complete without Christ the Lord is Risen Today/Jesus Christ is Risen Today. Comes with Clouds Descending), and they provide language to express our desire to offer our highest praises to God (O For a Thousand Tongues To Sing!). At times, they simply stand in awe and amazement at God’s incredible love for us (And Can it Be That I Should Gain?). But in a larger sense, I like Charles Wesley for way more than writing my favorite hymns. Because for Wesley, the hymns -– magnificent as they are –- were but other tools in his toolbox –- yet another way of striving to reach every last person with the Good News of Jesus Christ. Charles Wesley wanted every last person on earth to have that same feeling of confidence and assurance in Jesus Christ’s love for them, just as he had experienced his own “strange palpitation of the heart” and assurance that Jesus loved him on that Pentecost Day in 1738. It’s no secret that this mission of Charles Wesley often led him right up to the edge of trouble. With his brother, Charles received disapproval from church authorities when, casting aside long-standing practice, he went out into the fields to preach the gospel to people who otherwise never would have had an opportunity to step into a church. And preach he did –- to thousands upon thousands. Charles Wesley was described by those who knew him as “a man made for friendship.” And for him, that’s what all those hymns, all those sermons, and all his work was all about: friendship with God and with neighbor. That’s a commitment, and a ministry, that we can sing about today and every day, even as we, like Charles Wesley, cast our crowns before Jesus… lost in wonder, love, and praise. 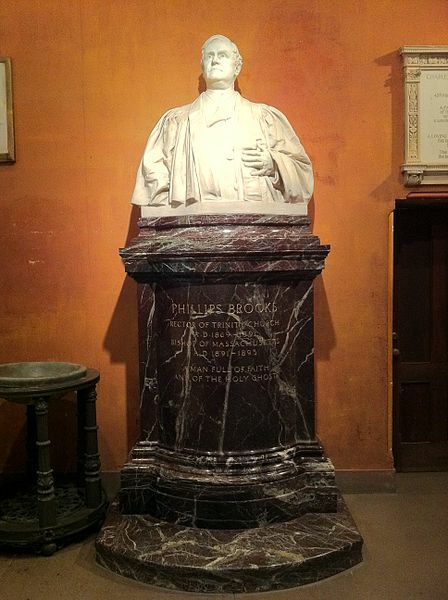 In the later decades of the 19th Century Phillips Brooks, rector of Trinity Church, Boston, was a national celebrity. It was a time when, unlike today, being widely-known, much less widely-respected and beloved as Brooks was, was no small feat. Once clocked by a reporter at preaching more than 200 words per minute, Phillips Brooks must have been a been a magnetic, not to say breathless, preacher. We can’t know. Thomas Edison’s phonograph was not widely in use by Brooks’s death in 1893, but Martin Luther King, Jr.’s son has claimed that the cadence of Brooks’s sermons influenced his father’s preaching style. If we have Brooks to thank, in small part, for “I Have a Dream,” then we owe a great debt. 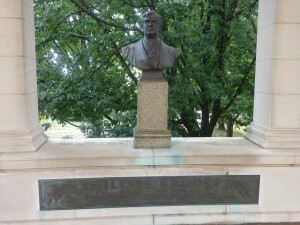 Upon reading his sermons more than 100 years later, it’s remarkable how overcome I am by a potent jolt of inspiration. I want to be a better person. I want to serve God with my best self and my whole heart. Sign me up! make an absolute failure of life, nor that we shall fall into outright viciousness, nor that we shall be terribly unhappy, nor that we shall feel that life has no meaning at all — not these things. The danger is that we may fail to perceive life’s greatest meaning, fall short of its highest good, miss its deepest and most abiding happiness, be unable to render the most needed service, be unconscious of life ablaze with the light of the Presence of God — and be content to have it so — that is the danger. That some day we may wake up and find that always we have been busy with the husks and trappings of life — and have really missed life itself. For life without God, to one who has known the richness and joy of life with Him, is unthinkable, impossible. That is what one prays one’s friends may be spared — satisfaction with a life that falls short of the best, that has in it no tingle and thrill which come from a friendship with the Father. Brooks knew that it all comes down to love, as he shared so eloquently in a letter to young Helen Keller. The words Brooks shares are not bound by time. “The hopes and fears of all the years are met in thee tonight.” Indeed, they are met in Christ every night of our lives. And his call to prayer to a God who knows no bounds sounds like it was written yesterday. 165 Comments to "Charles Wesley vs. Phillips Brooks"
Omigosh. This is the hardest of all. Sorry, Charles, I have to go with the man who wrote “o little town of Bethlehem” ! Thanks for the gorgeous Gastropoda! While I was lost in mollusk admiration I thought “Wesley would write a hymn about this, and Brooks would compose an oration.” I would rather sing about snails than listen to a snail-centric speech, so Charles gets my vote today! All four of this years Faithful are amazing Saints. Thanks to the SEC, and to you, my brothers and sisters, for a wonderful Lent. May your Triduum be rich as well. PS – Wesley for the G.H. Unsurpassable. Thank you Mark, yours as well! BTW…..what’s a Triduum? I’m a lifelong Episcopalian (all 53 years!) and only learned this word this year. It is pronounced trij-oo-uhm. I hope this helps. According to Wikipedia:Easter Triduum, Holy Triduum, Paschal Triduum, or The Three Days, is the period of three days that begins with the liturgy on the evening of Maundy Thursday (the vigil of Good Friday) and ends with evening prayer on Easter Sunday, the three-day period therefore from the evening of Maundy Thursday (excluding most of Thursday) to the evening of Resurrection Sunday. It recalls the passion, death, burial, and resurrection of Jesus, as portrayed in the canonical Gospels. On my bracket, Harriet Bedell goes all the way for the win. Don’t believe me, SEC? Check your private message records unless you delete them as you go. Then you’ll just have to trust me. Ditto! It looks we will go down for the fall, though, and I will have voted for the loser the last four races. Honestly! Some people’s children…. Tomorrow? An impossible choice. Going back to bed. This was the most difficult vote of all for me. I finally went with Brooks because I have copied down so many of his prayers for my own use-but I sing so many of Wesley’s hymns with love in my heart. Sooooo difficult!!!!!!!!!!! I was reading the essays and thinking, “How in the world will I ever vote?’ Then I read, “Pray not for crutches but for wings,” and that was that. What a fabulous Faithful Four. And what fine Madness this year. Thanks to Tim, Scott, the CBs, the comment writers, and all. Blessings to you this Holy Week. Its all about love. Phillips Brooks for the golden Halo!!! The Hall of Fame, where Brooks bust resides, is in the song in The Wizard of Oz – the munchkins sing, ” she’ll be a bust, a bust, a bust in The Hall of Fame”! It’s about more than the hymns! Reading the two excerpts of Brooks thought above moved me solidly in his camp. Then again, a Wesley win would be a nice set-up for a Bedellian Halo. Vote based on passion or strategy? Hmmm. I’m beginning to think that Charles would indeed have beat Bach in a head 2 head. But, in the spirit of the Voice, I wonder — recite Charles sans music, as poetry, vs a lyric-less Bach. Apples vs. Oranges, you say? But Ms. Cooper made that matchup moot. I think, as much as I’ve learned to admire Rev Brooks having been introduced to the man by LM, I can carry a collection of sermons in my pocket, and be in awe of how lucid and timeless and relevant they are. But much of Charles, I carry in my heart — some even absent attribution. The glories of my God and King, the triumph of His Grace. Look at a Saint, and see instead, God. Charles for the Halo. And next year, when I celebrate my 60th birthday on Charles Feast day, I’ll celebrate with his image on a LM mug, which cup runneth over. “Ear worm”–another new term I’ve learned this Lent. Dang, Celebrity Bloggers! *wipes tears from eyes* Thought I knew who I’d vote for, but now it’s hard to choose … ! I voted for both in earlier rounds, and feel moved by the powerful persuasion of both bios– but feel compelled to go with my heartfelt response to the goodness and greatness of Servant Phillips Brooks. Thank you SEC for a great fun time during Lent. My bracket has Harriet Bedell for the Golden Halo. There is just something about missionaries that I am in awe of! Thanks, again, to all. Those quotes of Brooks’ sealed it for me. By far the toughest choice of Lent Madness so far! It’s madness to make a choice between these fine examples of godly living. Tim, o ye of little faith. I had Bedell in the GH round. Ask Scott. I sent him a pic of my bracket before Ash Wednesday. Had her going against Bach, though. Charles petting the pup almost swayed me . . . but those sermons! Had to go for Brooks. I voted for Brooks, but if he wins, Heidi will be writing against herself. I also had Bedell all the way. As much as I enjoy Charles’ music, and Phillips’ inspiration, tomorrow’s vote goes to Harriet, a woman who did not just talk, but walked the great walk! This choir member in this season must vote for the lyricist to “Christ the Lord is Risen Today.” I have always found “O Little Town of Bethlehem” to be kind of wishy washy. Really? Wishy-washy? “But in thy dark streets shineth the Everlasting Light” To me that is powerful. Help! In this most important vote, I can’t tell if my choice has registered. I do not want to jeopardize the voting by voting again. What to do, what to do? Been there. All this technophobe knows is if you saw the Results displayed after you (think you) clicked on the vote button, your vote went in. In the display for Results, the person for whom you voted is in bold letters. 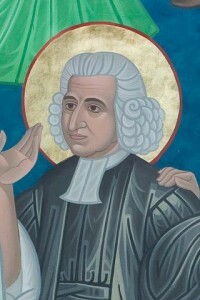 I was born and raised a Methodist (until I fell in love with the Episcopal liturgy) and I must say that the portraits of Charles Wesley in today’s post were a complete surprise. Always knew about the hymns, of course, but he and his brother always seemed intimidating to me as a child. Love the one with his dog! Ditto on our backgrounds, Betsy. I’m not “Houston” but I’m from Houston.If you’re ever in London, hop over to the East side (actually, it’s on a bus route) to the Wesley Chapel & House. It’ll reaffirm all those stories about the Wesley boys we learned in Sunday School. Glad to be an Episcopalian, but glad I had Methodist SS & VBS & hymn sings as a child. Yes! My good friend, Claudia, has Harriet winning it all! And I HOPE SO, TOO! What a tough choice! I located a copy of the collection of Phillips Brooks’s sermons mentioned in one of the earlier contests and ordered it (via abebooks.com). It arrived two days later even though sent as “printed matter”. (Was that a minor miracle or sign?) It is wonderful reading so I had to go with Brooks – despite those wonderful Wesley hymns. Surrounded by my dogs, I have to vote for Charles. I did not share with my dogs the fact that I voted for Phillips Brooks. I didn’t either, Anne. My dogs will forgive my vote because Phillips Brooks preached love and that’s what they are looking for every minute (except when another dog dares to walk by our house). The friendly one or the impressive one? I’m going with Phillips, just because he is not chummy, but so impressive–“the largest prayer” did it. O, for a thousand votes to cast! I know, I know. I only get one. I agree with Paul; wish I could vote for both! As a professional writer, I’m in awe of Brooks’ highly quotable sermons. I had only known him as the author of O Little Town of Bethlehem (one of my least favorite Christmas hymns). The fact that he probably influenced Dr. King also impressed me. But I personally connect with the divine through music, and as a choral singer I have always loved the hymns of Wesley. (Although that has as much to do with the tunes, which he did not write, as the words.) I really need to ponder this one before I vote! Phillips Brooks is awesome, but I will always vote for Charles Wesley. I love that picture of him grinning and petting his dog! But still….I think Harriet Bedell is going to win the Halo. I’ve felt this way for a long time…..
Chrism Mass last night, GH on Wednesday followed by the Triduum. Also, my buttercream Easter Eggs are already made. Life is good! Thanks to the whole LM team. I have so enjoyed this season. As a Catholic, I learned about many more holy men and women, like Harriet Bedell. This has been a wonderful Lenten Season. I couldn’t follow it on FB as I give that up for Lent each year. This was the hardest year ever. Blessings on all the leaders and subscribers. Harriet for the win! How do you make buttercream Easter Eggs? Music speaks for me, when I can’t. Had to go with Brooks. His double vision–of the danger facing us all, and of a world suffused with the Glory of God, of missed chances and a world in need–recapitulates all that calls to us in this Holy Week. As someone else wrote, Charles Wesley’s hymns are written in my heart! And my soul! And the mission statement of my home United Methodist church, Christ Church in Manhattan, is essentially “Love God and neighbor”. Charles did that and wrote many expressions of it, including “Jesus, Lover of My Soul”. For me, it’s Wesley all the way. There are too many commenting here who do not understand hymnody or music. First, MUCH of Lutheran hymnody comes from Bach chorales — with “no words”, baloney. Go through all of the Cantatas — they all have words! Second, Wesley’s hymns were not “mere” poetry. They were intended to be set to music! He even suggested many of the hymn tunes! Who are you kidding? Music is a universal language and a gift from God. As St. Augustine of Hippo said “Those who sing pray twice!” Charles Wesley’s influence through his hymns is wide-spread and crosses denominational boundaries. And there is no comparison between 6000+ and 1. As the write-up indicates, Charles Wesley’s influence was much more than hymns — even in the Lutheran Church calendar, he and his brother are listed as “Renewers of the Church.” But that influence is through the impact of those 6000+ hymns! Wesley’s impact is certainly too broad and encompassing not to vote for him! Phil — your thoughts here seem partly in response to my musings earlier on whether Charles Wesley would beat Bach head to head. And I still wonder about such a hypothetical contest, especially free of false attributions (Wesley taking credit for a favorite tune, Emery taking credit for the Underground Railroad, Mozart taking credit for the libretto, and so on). Perhaps Bach wrote the words and music both to his chorales. I don’t know. Perhaps you do. And I doubt I’d ever have said “mere” poetry. — above my words were “sans music, as poetry” — free of misattributions. The fact is hymnwriters and hymn composers are NOT separable in that fashion nor is any musical form with words like opera, or oratorios, or canatas separable into lyricist/librettist and composer: they go together, and a composer cannot write the music without the words, nor can the librettist/lyricist write the words without the music! Die Zauberflöte would be nothing without Mozart AND Emanuel Schikaneder (the librettist), W.S. Gilbert would be nothing without Sir Arthur Sullivan and vice versa. Bach’s cantatas were never meant to exist without the words. Handel’s Messiah would not be the magnificent piece it is without the words. Hymnwriters like Isaac Watts and Charles Wesley and Fanny Crosby, and many more, did not write in a vacuum — they intended their words to be set to music not as “mere” poetry. There is a special talent required to be a hymnwriter, lyricist, librettist. Those words are indeed an integral part of the “music”, not separate! Bernie Taupin! Yes, for “Border Song.” Although, a GH for one song seems…disproportionate. Is he a saint? All those hymns! While many are quite good, the problem with them is that when I think of them I only hear them played on the organ. And given a choice between eating chitlins or listening to an organ–I would choose the pig intestines! I wish I could imagine Wesley’s hymns on … oh I don’t know, … an oboe! Now there is a fine instrument! Sorry, Charlie, O Little Town of Bethlehem would sound great on a toy piano so I have to go with Mr. Brooks. Versatility, imagination, and the humility of a Jesus that can be praised everywhere, all the time, by anyone and everyone. Shout out to Boston today! So I must go with Brooks and Boston. I love hymns but a good preacher speaks to my soul. 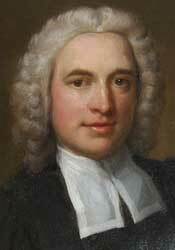 Charles Wesley: it wouldn’t be Easter without him. I voted for him, but I wouldn’t go so far as to let him define Easter! Charles Wesley all the way. For he (and she) who sings prays twice. Hymns often convey God’s truth in ways that mere speech cannot. Sorry, Phillips. This Methodist must vote with heartfelt joy for Charles. 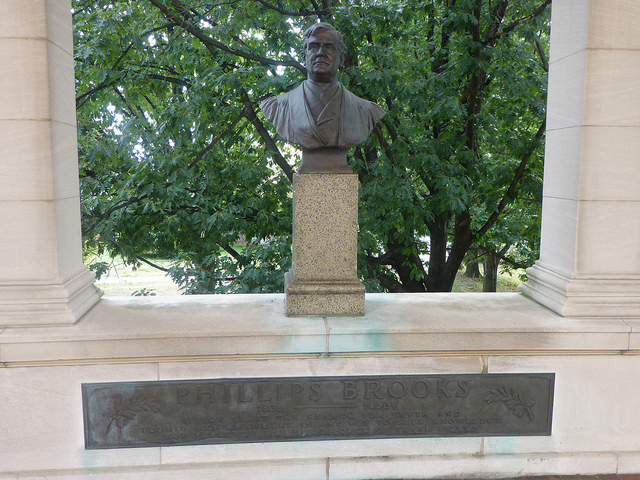 Nevertheless, I voted for Phillips Brooks because I agree with him that the greatest danger is not failure but mediocrity. The last sentence, “Pray not for crutches but for wings,” nailed it for me. Pray not for crutches but for wings. I must go with the man who used music, much as Jesus used parables, to preach the Good News. Thanks, Charles. Oh I don’t know, I don’t know! I thought I was going to vote for Brooks, and I may still do so, but the “man made for friendship” line really got to me. But then I had never heard of Brooks before LM, and I’m so grateful to have been introduced to him, and since he’s not faring so well in the polls, that may make the decision for me. Charles Wesley all the way! Both are deserving, but Charley touches my heart and soul. Gorgeous hymns, “a man made for friendship” and his portrait with a huge grin and his puppy. What a lovely gentleman. Need I say more? Let us also remember that Brooks was an Abolitionist. He also supported the right of African Americans to vote, which really makes him stand apart. So, in addition to his fabulous preaching and inspiration, he was deeply popular with the people for many reasons. Go Brooks! A really hard choice — but the quotes from the sermon and letter of Brooks tipped the scale in his direction. It is time to GET OUT THE VOTE…for Phillips Brooks! Sure Charles Wesley wrote some fine hymn texts, but anyone who can preach 200 words a minute and still be inspirational gets my vote and my admiration! What?!?! Charles is trouncing Phillips?!?! This is … No! No! Our Dean’s father, in his robust 70’s, re-enacts Wesley in a wonderful original presentation so miraculously that you are transported back in time during the musicale….and yes, I am indeed “sucking up”! As a deacon, I’m non-stipendiary so it’s not like I’ll be getting a raise or an office with a view. Brooks’ sermons are indeed jewels but he is regional and everybody’s not from Boston, or as the Kennedy’s say..”Bah-stun”. Please, no stoning of the deacon for blasphemy! Charles Wesley and his hymns ? There is hardly any corner of the world where at least one of his hymn lyrics isn’t known no matter whose melody is being sung. I, too, greatly admire the sermons of Brooks but the Wesley hymn lyrics are literally imprinted on my brain and in my heart and on Easter morning that’s what will come out of my mouth, gloriously I hope… for in truth, from my heart and mind and soul, I will once again know that JESUS CHRIST IS RISEN TODAY ! Apparently Charles Wesley was also a dog lover! That didn’t cinch the deal for me, but it helped. Go, Charles! And, anticipating tomorrow’s match up, though the Wesleys left Georgia earlier, their spiritual descendants were very active Methodist ministers to the Cherokees, especially, and opposed Georgia’s takeover of Cherokee land. It was a Methodist minister who took a case all the way to the US Supreme Court, where the Court under Chief Justice John Marshall declared Georgia’s land grab illegal. Then Pres. Jackson got Congress to pass a federal removal act, creating an “Indian Territory” in what is now Oklahoma. It was one of the first official “ethnic removals” in US history. Words of a hymn will stay with you longer than words of a sermon. Not a tough choice for me. I’ve been singing Wesley’s hymns since childhood. And I noted a comment above comparing regional influence to world-wide influence. Both men were powerful presenters of God’s message, each in their own way. But Wesley undoubtedly has touched almost everyone who has ever set foot in a church, and that is a huge accomplishment, worthy of our admiration and praise. I think I know who is going to win this thing. Yep, another hard decision but If I cant have Bach, then it has to be Charles Wesley. Over 6000 hymns! Just imagine how he must have been inspired by the Holy Spirit. But if Brooks get it, I won’t be disappointed. This has been my first LM but it won’t be my last unless I don’t make it to the next one! Not all sermons move one … words of a hymn stay with you and can be recalled whenever one wishes. I find myself constantly humming one of my favourite Lenten hymns. Thank you Charles Wesley. O Little Town has already trumped the UTO !!!!:(. I hope that it will not overpower The First Noel, and 18 others–many that I love. And those are just the ones in the Episcopal hymnal. One hums hymns, not sermons. The tune helps one to remember words and the joyous music that help one to remember those beautiful words. Thank you Charles Wesley for your wondrous hymns of praise to our Lord. Had to go with Brooks. Wesley’s hymns are grand and guaranteed to produce that familiarly cozy religious/church feeling and I’ve played and sung enough of them to know, but Brooks for me is more substantial than that. Just messaged my nephew – who is at school in Oxford, England. He is voting for Charles Wesley. Anglicans from Oxford are bringing in the vote!! Charles Wesley for the Golden Halo. My dear mom loved his music, and I shall remember her fondly this Easter Sunday as we sing his wonderful music. Both of these men have been tops in my book for years, so this may have been the toughest choice of all for me. In the end, it was Charles…maybe (and this is a pretty thin excuse) because the picture of him with his dog tipped the scales. But then…there are all those hymns I’ve known and loved all my life. Somewhere, my Methodist grandmother is dancing, but I would remind her that both Charles and John died Anglicans. Thank you to the SEC and the Celebrity Bloggers for a wonderful, educational, and spiritual Lenten devotional discipline. This was my first Lent Madness and I learned so much from you and all those who made such in depth and enlightened comments. I’m already signed up for 50 Days of Fabulous, so I hope I will be seeing many of you in the near future. Oh, make it hard, why don’t you. Charles Wesley wrote so many of my favorite hymns. Bp. Brooks went to VTS, though he was not particularly impressed with the place. Alumni loyalty won, just barely, but I already half regret not voting for Charles. “O Little Town of Bethlehem” was my favorite as a child, but today my ear worm is happily “Love Divine All Loves Excelling”. Glad to have learned about Brooks but have to go with Wesley! Scratches on pieces of paper that translate to sound and the Glory of God. I had Bedell vs. Emery, though I believe I had Emery winning. At least one side of my bracket looks ok. I have an early childhood memory of “Hark, the Herald Angels Sing” that has nothing to do with Christmas. It was always one of my favourite carols (perhaps thanks to those annual broadcasts of A Charlie Brown Christmas?) but one day in the off-season the tune escaped me so I went in search of my mother to remind me of it. I found her in her bedroom, crying. I had never seen my mother cry before and it worried me. She explained that she was sad because she’d just gotten word her best friend’s mother had died, whom she had known since she was a little girl growing up in her home town far away and who had been very important to her. That helped me understand, and I hope it helped her in the telling, but I was six and didn’t know what else to do except ask what I’d come in there for: the tune to “Hark the Herald Angels”. My mother, bless her, looked at me for a moment, then composed herself and we sang. For that moment of (I hope!) mutual comfort in a long line of loving women, mothers in the faith, I must vote Wesley today. I’ve vacillated already twice between Charles and Brooks, Brooks and Charles, while reading the Comments. And then I remembered what happened in Boston near Trinity Copley Square a year ago today. As with LM, all the contenders had some potential. Some got crutches, others got wings, and many lived to run another day. The city’s spirit was not broken. Then the Red Sox won the World Series at Fenway Park for the first time ever on home ground. LM has again been a Marathon. In honor and memory of those who ran, and will return to run again, I place my vote for Philips, a stranger who became a friend because of LM. Celebrating the lives of both. Thank you, all. This proves not only the beauty of the saints lives, but also the glory of the write-ups! After reading this one about Wesley, I was enthralled. Thanks, David Sibley, for making him so accessible and so delightful. Love those pictures of him looking so happy and welcoming! Charles Wesley for the win! It’s all about the dog. 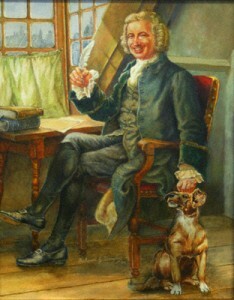 Every parson should have a dog to sit at his feet in the office. Charles, you are the man! Another toughie, obviously, but my vote goes to Philips Brooks today. I love all the hymns, but Philips Brooks ministry touches me in a way I am not sure how to explain. Child of a choir director, raised Methodist, now Episcopalian and devoted hymn lover. My funeral will have to include “Greatest Hits” because my list of hymns to sing is too long for the service :). Yet as much as I love Charles Wesley, and I truly do, I am sad that Brooks is running behind. His words, his ministry and his life move me deeply. He is the Saint I seek. This was very, very hard. I voted for both of them all along, and now must choose. As a long-time choir member, I love to sing Charles Wesley’s hymns, but sometimes it is easier to just sing familiar hymns than to reflect on the meaning of the words. The various quotations from Phillips Brooks’ sermons resonated with me, so my vote goes to him. Either way, that are both great, as is Harriet Bedell, whom I voted for yesterday. Tomorrow will be another toughie. “There is one universal religion, Helen – the religion of Love. Love your Heavenly Father with your whole heart and soul, love every child of God as much as ever you can, and remember that the possibilities of good are greater than the possibilities of evil; and you have the key to Heaven.”- Phillips Brooks for me. Go for the Golden Halo! I find that statement troubling theologically. It is not our love for anyone, we are imperfect about anyone we love. We put conditions on that love. And it is not about what we can do — it is a given that we will utterly fail at that! It is about Christ’s love unconditional and his Amazing Grace (another line from a hymn) — granted not because we deserve it, but because God’s infinite love for us caused him to send Christ into this world to bring about salvation. Not our doing, but God’s doing! From other Brooks’ quotes, I don’t think that he would disagree with you: grace is God’s initiative and is given abundantly to all without being earned. You would be correct if Brooks was speaking to someone who just wanted to be good and had not received grace. I doubt Brooks or Keller were of that sort. Grace is real, and once received, there are implications…there is a response. His sermons challenge me to pass on the grace that I have received. It is not a gift for me alone. 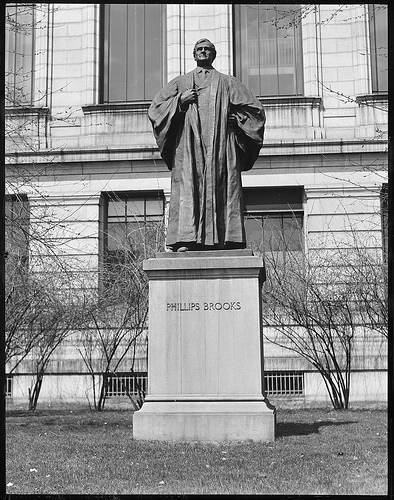 Voted for Phillips Brooks–“That is what one prays one’s friends may be spared — satisfaction with a life that falls short of the best, that has in it no tingle and thrill which come from a friendship with the Father.” Perhaps that’s what St. Paul meant by “[falling] short of the glory of God,” just missing the glory. Thanks for introducing me to this amazing stuff. Whoever wins today, tomorrow’s going to be really tough! What we need here is a setting of a Brooks sermon to Wesley music. Followed by an urgent petition to the SEC via the Clairvoyatron to make the Halo bigger. I find it remarkable that Charles Wesley has made it all the way to the Final Four when he was on the lineup in 2011 and was knocked out by Perpetua in the first round. It really is the luck of the draw to some extent, isn’t it? Have to go with Wesley on this one. My love for “singable” church music must prevail. (Good on Luther for his quote about she who sings prays twice.) I sat out J. S. Bach–my favorite creator of melodies–and was astonished when he lost (Christina the Astonishing being my first and most enthusiastic choice lo! these many weeks ago). Next choice was Lydia, but she went down also. So I’m not sure I’m doing Chuck any favors here. But I have learned much during this Lenten “exercise,” so I’m grateful I hung in until the end. “Jesu, Joy of Man’s Desiring” is right up there with “Love Divine” sung to Hyfrydol (hope the Anglicans will try that combo some time). FYI It was St. Augustine of Hippo who “he who sings, prays twice”. Yes, Phil, I did a mea culpa on that on another post. So many deserving candidates for The Golden Halo. Perhaps the three of the Faithful Four who did not advance to the final matchup should automatically be included in 2015’s Madness? Or at least the lower vote getter in the last round (cannot use the word “loser” here!) could automatically compete in 2015. Just a thought…… Thank you for a lively Lenten Madness filled with difficult choices! I really like this idea. As a newcomer to LM, I looked up the past years’ brackets to see who had already been considered. There are sooo many for whom I would have liked to vote. Perhaps the “lower vote getters” in each of the other years could return as well as this year’s for 2015. Thank you all again for an enjoyable and enlightening Lenten devotion. I voted for Brooks–love his prayers and preaching–and the family connection–he baptized my Granddaddy. But I won’t be sad if Wesley wins this penultimate round–his hymns have blessed so many. Thank you, SEC for a wonderful LM adventure! The real winner are US – the voters. We learn so much from the CBs, thank you! Thanks also to the SEC, Maple Anglican and the Archbishops. I totally agree with JAMG. I have so many resources and sites and books I want to research and read after this years LM. Thanks to everyone from the SEC to the commenters. For those of you who want a little Phillips Brooks this Eastertide, here’s a hymn he wrote. For those who want your Charles Wesley with something other than organ here’s a contemporary setting. I can’t say how disappointed I am that someone would vote for someone in the belief that he’d lose the next round so a woman would win. The nice thing about LM is that it lacks that kind of basketball stuff. I may have to reconsider doing this next year. I am so grateful to this community, which has made this the most joyful Lent of my 50+ years. I know I’m supposed to save this for Sunday, but Hallelujah!! Anyone who’s bio mentions Dr Martin Luther King gets my vote. I may not hit the vote button tomorrow. All these nerve-wracking choices are driving me Nuts!!!!! Shoot, let’s distribute haloes to everyone. Ah, Madeleine, but they already do have them. I rather hope the halos are like the angels’ wings painted by Fra Angelico, a rainbow of color. Ooo, Ooo, is Fra Angelico eligible for LM next year? Equal opportunity for visual artists! Thank you, Fr. Tim, Fr. Scott and CB volunteers for a wild and crazy Lent Madness 2014 ! It’s been enlightening and stressful. Sort of like difficulties encountered by many of the saints. But, only sort of. Thanks for introducing these 32 saints to us Moderns! While I’m at it, thanks to the sec for yet another LM filled with hair-pulling choices. You guys are sick! Neither. They both beat out far more worthy women for reasons passing understanding except for musical ones. So I vote for Julia Chester Emery. And at the church I serve, on my bracket she will be receiving the Golden Halo. Okay, went with Charles. I’ll be humming hymns for many days. And then there’s this – not sure how it didn’t make it into the kitsch round. Harvard comes through again! He’s got a prep school named after him as well. Such awesomeness! I cannot believe I didn’t do a youtube search for Phillips Brooks before the kitsch round. In the words of Jacques the cleaner shrimp, I AM ASHAMED. Still, PB’s had a good run and I can take comfort that – unlike a CB I could name – I did not rely on a cute pet doggy painting to help him get to the Golden Halo. The Deaconess is not to be underestimated. Note for next year: cute painting of favorite saint with cute dog–sure vote getter! Well, here’s how far off my bracket choices were. At this point, I had the faithful four thus: Lydia Vs Harriet Beecher Stowe, and Aelred Vs Julia Chester Emery. Then, Aelred triumphs in the end (against Harriet) . Friendship was Aelred’s “thing” and since that was mentioned in the write up of Wesley today, I’m one of Charlie’s Angels. “The danger is that we may fail to perceive life’s greatest meaning, fall short of its highest good, miss its deepest and most abiding happiness, be unable to render the most needed service, be unconscious of life ablaze with the light of the Presence of God — and be content to have it so — that is the danger. That some day we may wake up and find that always we have been busy with the husks and trappings of life — and have really missed life itself. ” That settled it for me. I have learned about more than many wonderful saints during Lent Madness this year. I have learned that I am just as susceptible to ‘tribalism’ as the most devoted sports fan or political junkie. When my demigod Bach lost in the first round, my attitude turned to sour grapes. I really didn’t enjoy the rest of LM very much because my choice was out of the running, in spite of my belief that he should be the winner of the Golden Halo, and especially because I perceived the voting wasn’t done by using the same criteria when comparing. So it has been a lesson in humility for me. It is a good Lenten lesson. Love both saints, will be happy either way. Decided to cast a vote for Brooks because 1) I agree with the liturgical sign of pulling the altar away from the wall and bringing it into the middle of chancel 2) I want “Duty makes us do things well, but love makes us do them beautifully” on a mug or t-shirt 3) Couldn’t have said it better myself: “He is here. He knows me and I know him. Oh, great, there are those dratted ninjas slicing onions. You’d think on this first anniversary of the tragedy at the marathon we’d honor the Bishop of Boston, but I guess we’d rather sing! I do love Wesley’s hymns, but Phillips Brooks’ words are fabulous. Yes, pray for wings and remember that it is all about Love. What a difficult decision! I’ve always loved the Wesley bros–spent my first 18 years in a Methodist parsonage, in fact. No one was United back then. 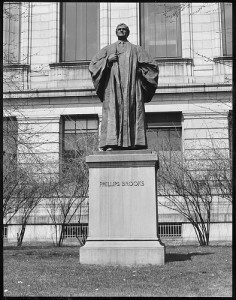 But Phillips Brooks surely knew how to touch people’s hearts w/ his preaching, & as an American, he helped develop this country’s values & ethos. So I had to show my care for our country which surely needs all the help it can get right now. I won’t be unhappy with either of the final choices, tho.